Ion-beam sputter deposition (IBSD) is a PVD modality frequently employed for precision coating of thin-film materials. 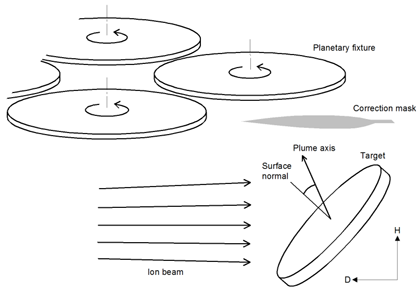 Unlike other sputtering modalities, the vapor plume from an IBS target is usually tilted as a result of the directional ion bombardment at a large incident angle. This brings in another geometric parameter to the coating process. If arranged properly, IBSD can provide outstanding coating uniformity and stability. In V-Grade 5S, you can easily create an ion-beam sputtering source by calling a build-in prototype source - you can define its dimensions, its 2D intensity profile, its vapor-plume function and set the angle at which the plume is concentrated. (If none of the build-in prototypes is suitable you can create an arbitrary IBSD source of your own in V-Grade 5S.) 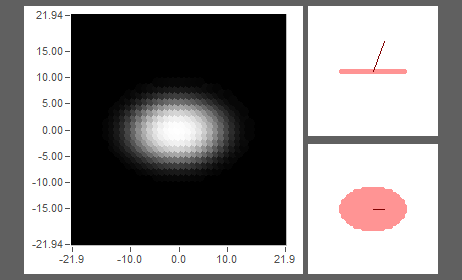 The following pictures show such a source as called (top) and after a rotation (bottom). This source profile is elongated to match a circular ion beam that is incident at a 50-degree incident angle. It is assumed the incident angle causes the plume axis to tilt by a 21-degree angle from the surface normal. Now we can build a virtual coater with the above IBS source (rotated) and the planetary fixtures that we employed in Case S4, as shown in the diagram below. There are four geometric parameters that we can adjust: D, H, the tilt of the target, and the tilt angle of the plume axis which varies with the incident angle and the energy of the ion beam. Carrying out some virtual experiments we can quickly determine sets of values that yield good thickness uniformity on the planetary fixtures with varied material collection. yields a thickness uniformity of 0.41% along the radius and a material collection of 29.2%. The thickness uniformity can be further improved if we employ a correction mask. Shown below is a mask design obtained through a combination of manual-fitting virtual experiments and the mask-optimizer routine. Priority is given, in the optimizer routine, to the preservation of the material vapor. The resultant mask is very slim: the widest place is only 2.3 cm. This is a short mask: it casts a shadow over the radius of the fixture, as opposed to the entire diameter. With the mask the thickness uniformity becomes 0.1% and the associated material collection becomes 28.2%. 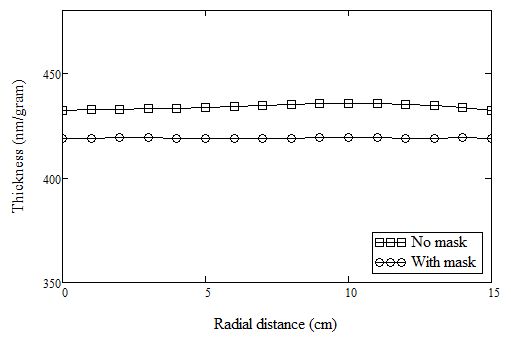 Again, all the thickness values are in unit of nm/gram: nanometer per gram of material removed from the target.